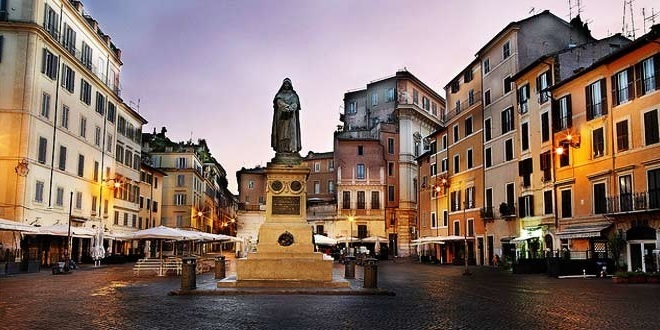 Our tour winds its way through cultural and gastronomical surprises, beginning in CAMPO DE' FIORI. This is a piazza who’s name was given thanks to its ancient existence as a flower field and cultivated garden. Contrasting this picturesque image, it was also a place of torture - home to hangings and executions. In fact, it was exactly here in the 1600s that philosopher and Dominican friar Giordano Bruno (accused of heresy) was burned alive. The statue in the middle of the square is dedicated to him; it was built in 1889 and still remains despite historical oppositions from ecclesiastical authorities. Today, Campo di Fiori hosts a very vivacious and colorful market, and by night the square remains one of the preferred hang-out areas for young adults, thanks to it being home to many hot spots which offer menus where guests can taste regional sections of typical cheeses and salami. Nearby, the Piazza del Biscione is an area where guests can taste tasty, warm “supplì” (or lightly fried rice balls) while the guide explains the rest of the great Pompeo's theatre, one of the first theatres built via masonry, and constructed in Rome in 55 A.D. by Pompeo Magno. Passing by the Largo del Pallaro and arriving at the Piazza dei Satiri, we arrive at the Church of San Carlo ai Catinari. The unique name derives from how many basins were manufactured nearby. It was dedicated in 1620 to San Carlo Borromeo, the benefactor of the order dedicated to Barnabas as well as an indispensible spiritual guide for the Church through the Counter Reformation. The lat stop is Piazza Mattei, which flanks the ancient Jewish ghetto. Here your palate can delight in typical products and specialties from the Hebrew Kosher kitchen.